Rare amphibian discovered in Stanley Park! 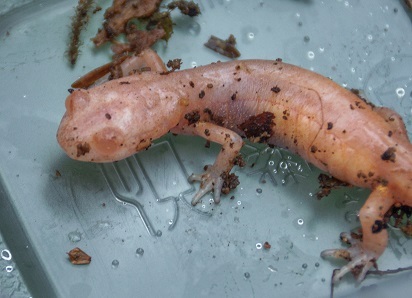 Videos » Wildlife » Rare amphibian discovered in Stanley Park! It was a drizzly Sunday morning on March16, 2014 when a dozen Stanley Park Ecology Society (SPES) staff and volunteers set out on a Herptile Blitz to survey Stanley Park’s reptile and amphibian populations. Led by Claudel Dupuis-Bourret and Elissa Astorino, two BCIT Fish, Wildlife and Recreation students, the group inspected temporary ponds, conducted forest site searches, and waded through Beaver Lake and Lost Lagoon. It is hoped that, by scouring a wide range of habitats and locations around the Park, SPES will get a clearer idea of which species live here and which areas each prefers. Based on past surveys, the crew expected to see evidence of native species like western red-backed (Plethodon vehiculum) and northwestern (Ambystoma gracile) salamanders, as well as invasive American bullfrogs (Rana catesbeiana) and green frogs (Lithobates clamitans). What they did not count on, however, was making a once-in-a-lifetime find …but that’s exactly what happened. At the first stop of the morning, Robyn Worcester, SPES’ Conservation Programs Manager, made an astonishing discovery: an albino ensatina salamander (Ensatina eschscholtzii) hiding under a rotting log! Ensatinas live in moist forests from BC to Baja, California, are nocturnal predators, and, unlike many other amphibians, spend their whole lives on land. Their populations in BC are considered stable and are commonly found in wooded areas around the Lower Mainland and southern Vancouver Island. Unlike ‘leucistic’ (unpigmented) animals like white tigers and piebald pigeons which still have dark eyes, true albinos lack melanin pigment throughout the entire body and have irises that appear reddish or pale blue. And, as you can see in the photos, the Stanley Park ensatina has pink eyes and pale, translucent skin. Surprisingly, while wild leucistic amphibians have occasionally been reported in North America over the last century, only a small number of true albinos have ever been found. SPES’ exciting discovery is one for the history books. 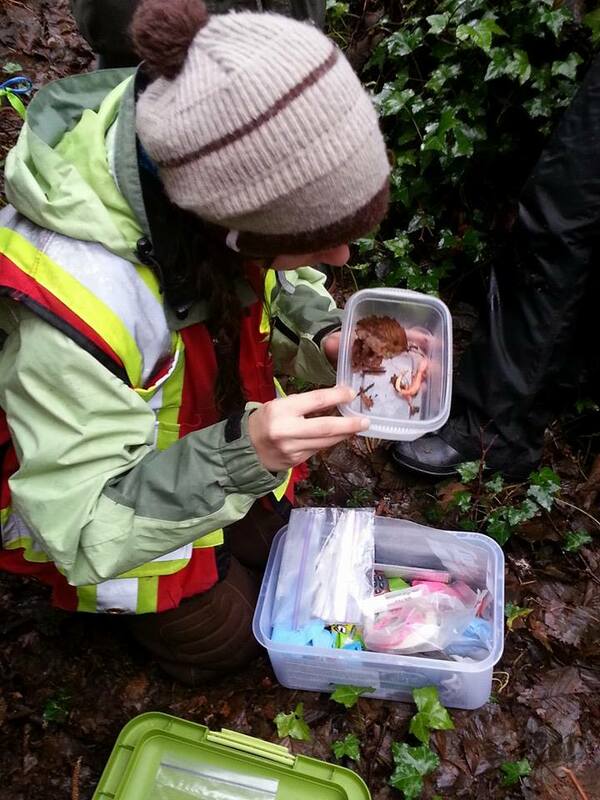 After being measured, weighed and photographed, the unusual salamander was returned to the safety of its log and the volunteer crew continued their surveys around Stanley Park. Interested in volunteering for one of SPES’ conservation projects?